The bathroom can be one of the most difficult rooms in the house to navigate using a wheelchair. Bathrooms are generally small, and the equipment inside them is not accessible to many wheelchair users. In order to modify your bathroom and make it wheelchair accessible, you will have to alter most of the room's components. To do this it is best to hire a professional contractor with experience in handicap modifications. Widen the doorway. A wheelchair needs a door width of at least 32 inches in order to fit straight in; if the doorway is positioned in a way that the wheelchair user has to turn the chair in order to enter it (such as being located in a narrow hallway), then the door needs to be 36 inches wide. Modify the bathtub and shower. If the handicapped person using the bathroom is confined to a wheelchair, a roll-in shower provides the most accessible option. For a roll-in shower, the wheelchair user uses a special waterproof shower chair and rolls it directly into the shower. This means that the shower floor must be flush with the bathroom floor and angled downward toward a drain. The walls should have support handles installed, and the water controls need to be low enough to reach from a chair and also accessible from the outside of the shower. If the handicapped person is able to stand for short periods, a regular shower can work if you install a shower seat or bench and hand rails inside. A tub with a walk-in door and a bench seat can also be useful in this situation. Adjust the sinks. The height of most sinks can make them difficult to reach from a seated position. 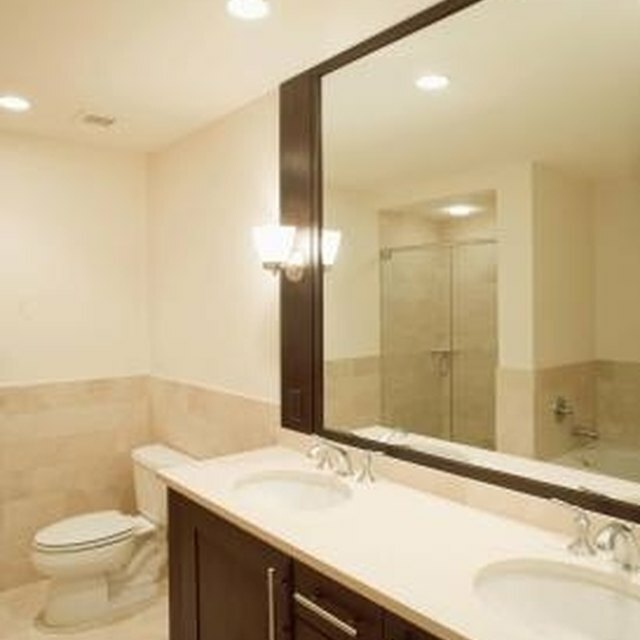 Lower your sinks and take out the under-sink cabinets so the wheelchair user can roll up closer to the basin. Adjust the position of the faucets so they can be reached from the front of the sink, or install a pedal operation for water usage. Raise the toilet. The height of a toilet can be too low for wheelchair users. Raising the toilet a few inches can make it easier to transfer from wheelchair to toilet seat. You can also use a higher toilet more easily from a specialized shower/toilet wheelchair. Next to the toilet seat, install a grab bar on the wall for support.